Betta fish are personable pets, as far as fish go. They are happiest when housed in an engaging environment, fed consistently and allowed to continually observe the people and goings on outside their habitat. A happy betta is one who is alert, has a healthy appetite and is swimming in clean, comfortable water. A betta will be happy if the tank you keep him in mimics his natural Southeast Asian habitat. According to Betta Care 101, wild betta fish exist in shallow bodies of water or rice paddies and have easy access to the water's surface. However, a domestic betta will appreciate a much larger living space than a rice paddy, where he can be as active as he wants to be. A tank no smaller than 2.5 gallons is recommended. You can use plastic plants and other small tank decorations in your betta's tank, available in local pet stores, and place them near the water's surface to provide your fish with resting spots. But never place more than one betta in the tank at a time. Due to their typically aggressive nature they are happiest when living a solitary life. Water quality is a key factor in the health and happiness of your betta fish. According to Pet Supplies Plus, bettas exist best in neutral water that possesses medium hardness. You can purchase a water testing kit from a local pet store to keep tabs on things like ammonia and nitrate levels. Coming from a warm climate, bettas need to be kept in warmer water, around 74 degrees Fahrenheit or higher. Your betta will be happy his water parameters are ideal and will show his contentedness through his vibrant colors, healthy appetite and flowing fins. Bettas are active fish. A happy betta shows it by swimming around his tank,in observance of all that is taking place outside of his habitat. 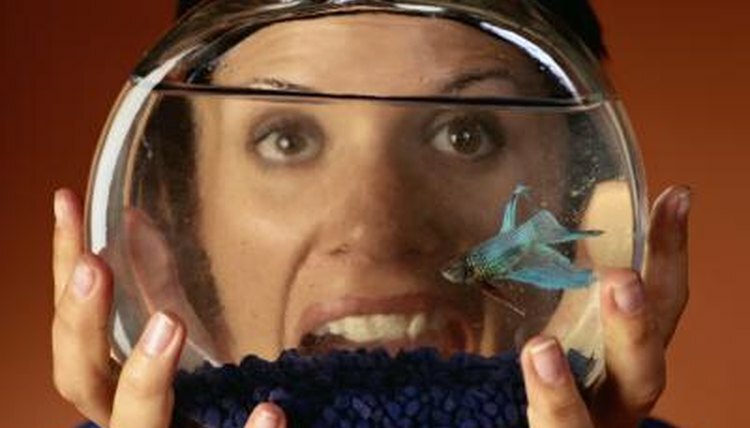 Placing the betta's home in a room that you spend a lot of time in will allow him to watch your movements. He'll swim to the top of his tank when you approach in anticipation of a feeding. Keeping his home away from direct sunlight or drafts will prevent the water temperature from spiking too hot or cold, which can place stress on the fish. Betta fish should be fed using flake or pellet foods purchased at a local pet store. According to Tropical Fish Magazine, providing your fish with an extra treat from time to time will help keep him happy. The publication suggests the occasional frozen or freeze-dried bloodworm or live brine shrimp. It's important not to overfeed your betta because it can make him more susceptible to illness, particularly diseases that affect the digestive tract or swim bladder organ, which helps him to maintain balance. Will My Betta Jump Out of Its Tank? What Does It Mean If Your Fish Isn't Eating? What Is the Average Life Span for a Carnival Fish? What Does It Mean if a Betta Fish Is Not Moving? Why Does One Fantail Goldfish Chase the Other?